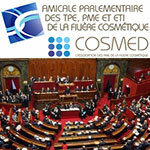 To establish a regular dialogue between parliamentarians and professionals in the cosmetics industry, the professional association Cosmed is initiating a Parliamentary Association of VSEs, SMEs and ETIs in the French cosmetics industry. Launched on 29 February 2016 with a first group of 200 deputies and senators, it has already registered its first memberships. The cosmetics industry represents an area of excellence in the French economy, in third place among our country's export sectors. Emblematic of French manufacturing and its worldwide reputation, cosmetics is now an exception with a balance of job creation that has always remained positive, even at the height of economic difficulties. Alongside the major leading groups that undeniably drive the sector's international image, 85% of the economic fabric is made up of VSEs, SMEs and ETIs, which represent the strongest growth in terms of jobs created. Today, the sector has 50,000 direct jobs spread over the territories of the new regions. In 2016, when growth and employment are at the heart of the concerns of every political and economic leader, it seems essential to establish a regular dialogue between parliamentarians and professionals in the sector. Indeed, no such body exists to date, neither in the form of a study group in Parliament, nor as a parliamentary friendship or club. This situation, being a sector that irrigates our economy and in which France has maintained a world rank, is paradoxical.